After learning about Lourdes and the miracle cures that are believed to happen there our classes made newspaper front pages that told the story of Bernadette's visions at Lourdes. They also recounted the story of Peadar Clarke's miracle cure of M.S. A pilgrimage is a journey to a holy place. 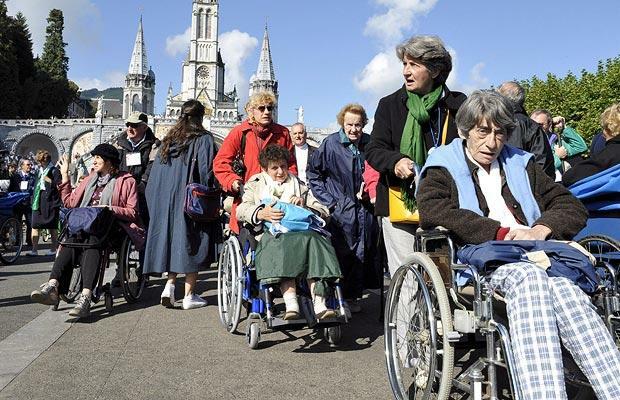 Catholics go on pilgrimages to places like Lourdes and Knock. Lourdes is a town in France. In 1858 a young girl called Bernadette was walking in the woods and she saw a vision of the Virgin Mary. Mary told Bernadette to come back 18 more times. One day Mary pointed out a water spring. These days that spring produces 27,000 litres of water a week. On the 16th visit Mary told Bernadette that she was the mother of Jesus. Around 8 million pilgrims visit Lourdes each year. They go there to pray, to touch and kiss the wall of the grotto and to collect holy water. We watched a video about Lourdes. 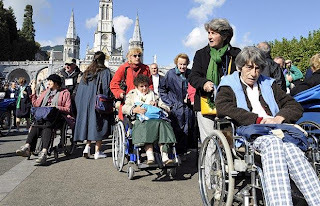 The video told of people who go to Lourdes looking for a cure from diseases. One man, called Peadar Clarke, suffered from M.S., he could not use his arms and legs and doctors told him he only had 4 years to live. He went to Lourdes and one night in his hotel room he saw the Virgin Mary, she was smiling at him. He stood up and put his arms out. He was cured of his disease. He really believes that he had a miracle cure at Lourdes. Here is a link to the video that we watched in class. Written By St. Coleman's RE class. 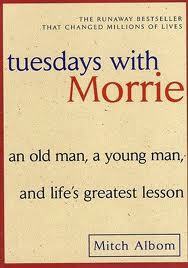 During last half term 6th year class, St. Ignatius, read Mitch Albom's novel 'Tuesdays with Morrie'. This book tells the tale of an aging and charismatic college professor, Morrie, who is diagnosed with the terminal disease, ALS. Not one to give up on life, Morrie spends his final months teaching his friends, family and admirers about life and death. One of his old students (Mitch Albom himself) spends a series of Tuesdays with Morrie discussing many topics ranging from love to family to work to death. Those conversations are the basis for this interesting and inspiring book. Here are St. Ignatius student Anna's thoughts on Tuesdays with Morrie. They meet again, later in life, by coincidence. Morrie and Mich pick up a relationship, but it doesn’t last long as Morrie died from his condition. Throughout the book, Morrie teaches Mitch about the important things in life. Even though Morrie was retired, he still had a lot to teach Mitch and he also learned from Mitch as well. He teaches Mitch about friendship, love culture, values and morals as well as the importance of getting meaning into his life. I came away from reading this book with a lot more than I expected. I learned the difference between life and death. I learned that love and family are the two main things in life, and that basing your life on material things gets you nowhere. Did I enjoy the book? Saying I enjoyed it would not give the full feedback because I did more than enjoying it. I would not do it any justice by saying that! What should you do to get that feeling? I think you should read it because it is a must read, an excellent book and definitely worth your time. 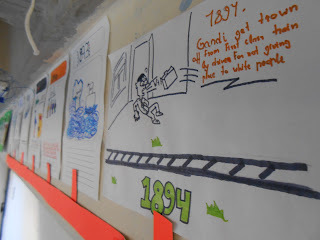 Continuing with our Judaism unit, second years have been learning about and discussing rites of passage. 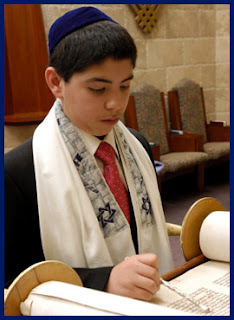 One of the most important rites of passage in a Jewish boy's life is his Bar Mitzvah, a special ceremony that takes place when he is 13. Iit marks his coming of age as an adult member of the Jewish community. 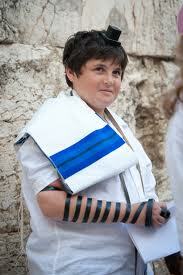 At his Bar Mitzvah the boy will read from the Torah at the Synagogue in front of his family and friends. The ceremony is usually followed by a big party! On their Bar Mitzvah boys will wear a prayer shawl called a Tallit and 2 leather boxes containing small pieces of the Torah, these are called Tefillin. St. Mels learned about these items and their significance. They completed a cut, paste and labelling task in class. The Torah is the most important of the Jewish scriptures. It contains the stories of creation, Abraham's covenant with God, Moses' exodus from Egypt and the 613 mitzvah or commandments that Jewish people try and follow. The most famous of these is the Ten Commandments- Given to Moses by God at Mount Sinai. 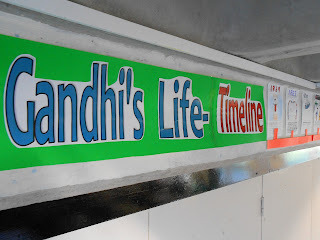 In class St. Colemans thought about what rules it was important for people to live by today. Here are the Ten Colemans Commandments! Do not slag off or insult others. Do not steal other people's stuff. Do not cheat on a loved one. Do not use violence against other people. Treat other people kindly and with respect. Don't be jealous of other people.